Interactive visualization offers new look at results of annual post-baccalaureate survey. 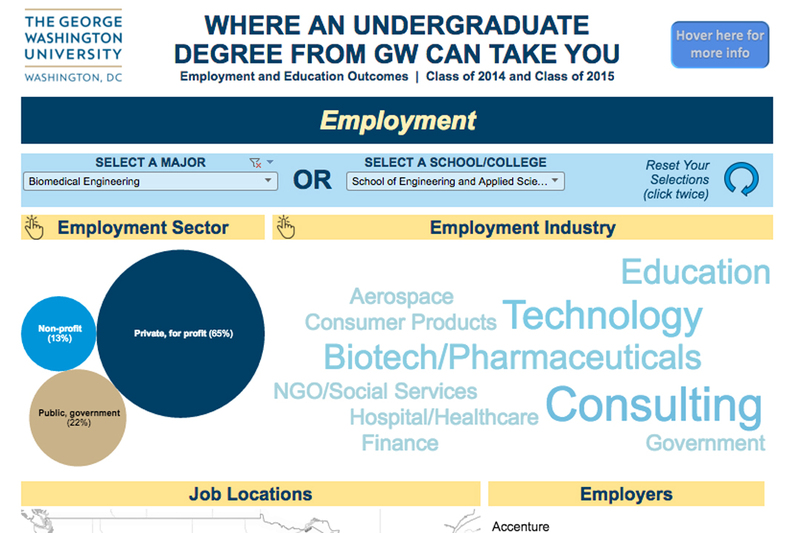 The George Washington University launched the new First Destination Visualization Wednesday to give students, alumni, parents, employers and others an in-depth view of the post-graduate success of the classes of 2014 and 2015. The interactive, virtual visualization offers a detailed look at the results of the annual First Destination survey, which highlights the activities of the most recent GW graduates during the first six months after commencement. The Office of Survey Research and Analysis designed the First Destination Visualization on Tableau, a public, data-visualization platform. It was developed in partnership with Information Technology-Business Intelligence, Division of Student Affairs Career Services and Planning and Outreach, the Office of Development and Alumni Relations, the Office of Undergraduate Admissions, the Division of External Relations and the GW School of Business. The clickable interface allows users to view survey data for the class of 2014 and class of 2015 by undergraduate major or school, as well as other categories, including job location, employer, salary and graduate degree and school. For example, a GW student earning an undergraduate history degree can sort by degree and see employers who have hired history majors. They also can see where employed graduates are living and their salary range. If a student is interested in working in a particular sector or state, he or she can see the percentage or number of graduates who are working in that sector or state. Zoe Spielvogel, a junior studying journalism and mass communication in the School of Media and Public Affairs, was among the GW students, alumni and parents who tested the visualization during development. Ms. Speilvogel hopes to pursue a career in production. Portland, Ore., native and GW parent Diane Hoffman—mother of freshman Elena Hoffman—said she was excited to see detailed information about the success of GW graduates. Nearly 87 percent of the class of 2015 has secured employment, enrolled in a graduate or professional degree program or is participating in military, community and volunteer service and other activities, according to the results. The results show a slight uptick from the survey results of the class of 2014, which came in at 86 percent. Nearly 2,000 members of the class of 2015 responded to the survey, which is administered by the Office of Survey Research and Analysis, Development and Alumni Relations, and the Center for Career Services. The survey methodology was altered last year to align with the new National Association of Colleges and Employers’ (NACE) standards and offers a more comprehensive understanding of the graduating class. “For two years in a row George Washington University has achieved a career outcomes knowledge rate significantly exceeding the national standard established by NACE,” said Manny Contomanolis, chair of the NACE First-Destination Survey Team. “George Washington University has demonstrated its leadership in this vital area of assessment." Recent graduates are now able respond to the survey on three separate occasions: mid-March of their senior year through mid-May, the summer following graduation and November and December during their first post-graduate year. Additional research and outreach is also conducted during this time. Class of 2015 survey results show that 57 percent of class of 2015 graduates are employed at a variety of companies and organizations including Deloitte, 2U, IBM, Clark Construction Group, the Malala Fund, United States Armed Forces and CNN, among others. The 18 percent of class of 2015 graduates continuing their education attend institutions such as the University of Michigan, University of Pennsylvania, New York University and Columbia University. Community and volunteer service, travel and other activities make up 12 percent of class of 2015 graduate activities, which include participation in the Peace Corps and Teach for America. GW alum EJ Goodroe earned a B.A. in criminal justice in 2015 after completing a six-year career in the Marine Corps and receiving an associate’s degree from Northern Virginia Community College. While at GW, he worked at the Office of Military and Veteran Student Services and interned for the U.S. Department of Veterans Affairs. He leveraged his education and connections to gain a position at American University where he is enhancing veterans’ services programming and resources. “Whether you are a veteran or a kid coming out of college, you just have to be aware of opportunities and put yourself out there,” Mr. Goodroe said. “From my first semester, I was conscious about trying to meet people because even when opportunities are available, success is about how you position yourself to meet those opportunities.